Reminder: Quaker Heritage Day is coming up! Just a friendly reminder that Quaker Heritage Day 2018 is coming up at Berkeley Friends Church! If you’re coming and haven’t let us know, please take a moment to register online. We hope to see you on the 10th! Cherice Bock is co-clerk of the newly formed Sierra Cascades Yearly Meeting of Friends. 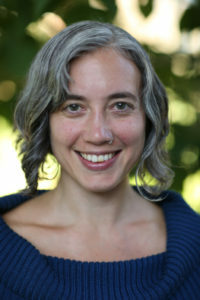 She teaches in the Creation Care Program at Portland Seminary, and is pursuing a PhD in environmental studies. A lifelong Quaker, Bock sees environmental concerns as one of this generation’s most important social issues. Visit her website at www.chericebock.com. Please join us at Berkeley Friends Church on Saturday, March 10, 2018, to explore these important issues with Cherice Bock. The attached flier (below) has more information about Cherice’s topic and the schedule and costs for the day. Please RSVP by March 3, 2018, to reserve lunch and/or childcare. Please spread the word in your meetings and churches– we hope to see you at QHD 2018! Comments Off on Reminder: Quaker Heritage Day is coming up!